Project submitted by Jim Scheetz, Endless Concrete Design, Zionsville, Pa. The concrete bartop and countertop were each cast in three pieces for structural integrity and easier handling. The homeowners wanted a free-form shape, as natural stone would have. "I used foam board and hand sketched the shape during templating, with the help and input of the homeowner," says contractor Jim Scheetz of Endless Concrete Design. The custom free-form edge and half-radius curves were created with foam and Bondo autobody filler. The lower drink rail was formed using slightly tapered PVC board. 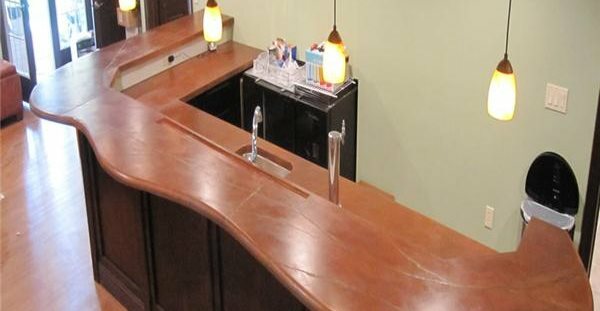 The bartop extends over 16 feet and returns 8 feet on one end. The lower countertop sits inside this footprint. Both the bartop and countertop are approximately 1 5/8 inch thick. The veining, which reveals pieces of polished glass, adds a gem-like sparkle similar to the veining found in natural stone. When your clients want a countertop that looks like a giant slab of stone, but don't like the look of granite, your options become very limited. "This project could only have been done with concrete, based on the customers' wishes," says Jim Scheetz of Endless Concrete Design (ECD), a company that specializes in custom-crafted acid stained concrete. The "wishes" of homeowners Abbe and Erik Kruger of Shavertown, Pa., were for a new bartop and an attached countertop surface with a drop-in sink for food and beverage preparation. They wanted the bartop to become the focal point of their entertaining area. Although they liked the rustic, organic appeal of natural stone, they still wanted an elegant look, with subtle mottled coloring. "They chose concrete because of the flexibility it provided to replicate stone," says Scheetz. "I suggested creating quartz-like veining similar to that found in stones indigenous to the Appalachian Mountains through Pennsylvania. Only the bartop was veined, as it was to be the focal point, and the countertop more subtle." A free-form shape, without sharp angles, was also desired to more closely resemble the irregularity of a natural stone slab. The veining was created by placing a slurry in the bartop form that hardened before the concrete was cast, leaving a void in the top after form removal. The void was filled to excess with a cement grout containing pieces of glass. The vein was then ground and polished to expose the glass. "The veining adds a sparkling detail similar to a precious gemstone being revealed in a stone," says Scheetz. To give the countertops an "earthy depth" and the realism of natural stone, Scheetz cast the concrete with an integral color and then applied acid stain in layers to the top surfaces. He also sealed the surfaces to enhance their appearance. "The sealer gives greater depth to the acid stain coloring," he says. "It was spray applied to leave a subtle texture mimicking that of stone's raw feel and to aid in scratch resistance." The countertops were made with a very dense, low water-cement ratio, high-performance custom concrete mix, which was cast in custom molds in ECD's shop. To help reinforce the countertops, PVA (polyvinyl alcohol) fibers were added to the mix and structural-block truss wire was strategically placed for strength, says Scheetz. Find suppliers of concrete stains. Find suppliers of concrete sealers. Scheetz says that the demand for decorative concrete is gaining momentum in his area, as more people become aware of the possibilities of using concrete to create custom, timeless works of art for their home. They also are choosing concrete because it's made locally out of materials acquired nearby. "Consumers are tending to be more conscious of their carbon footprint," he notes. "Concrete countertops can contain 80% or more of recycled post-consumer products, such as bottle glass. 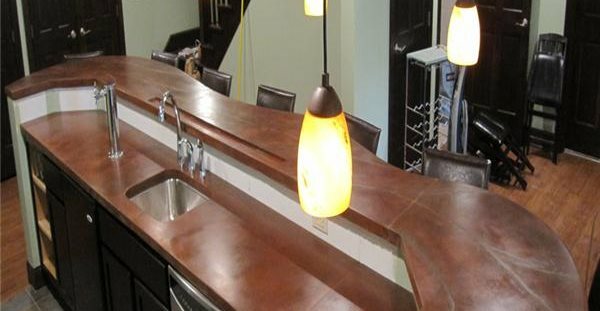 There also is a large number of concrete countertop artisans honing their craft across the country and around the world, so there should be an option to have your concrete countertop crafted by a local artisan."